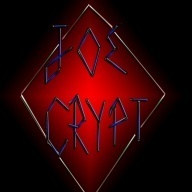 Joe Crypt is a member of industrial / alternative metal band, "Joe Crypt & The Dark Threat", founded in 2006 by Joe Crypt. The band has 3 full-time members and 1 colaborater. The main genre of the band is industrial / alternative metal.